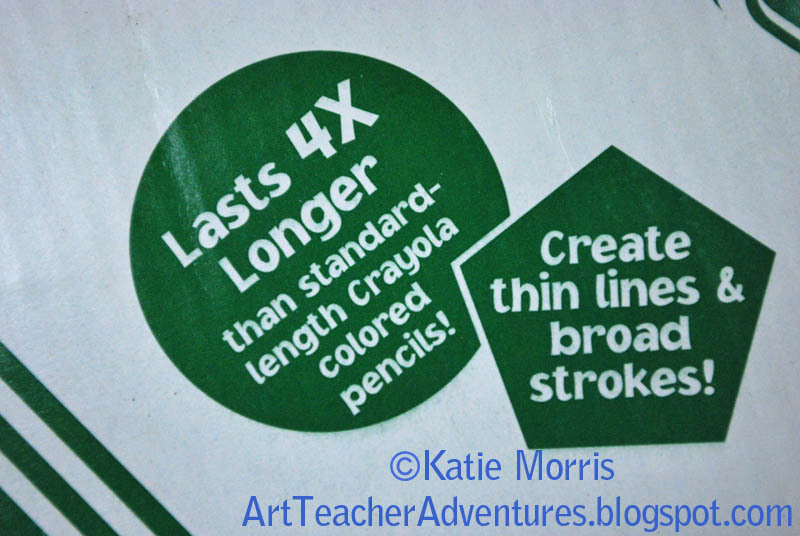 I finally have enough Crayola Color Sticks to use with a whole class*. I tested them at a KAEA conference a couple years ago and decided to give them a shot. The students really like them so far and I'm pretty impressed too. I wanted to make sure they were really a good value so I decided to be a little scientific and compare them head to head with Crayola Colored Pencils. *Last year I didn't notice that a class pack only has 10 of each color so there were not enough for a whole class. I applied even pressure for both supplies and only put down one layer of color. You can see that the layers of color look almost identical. The students seem to be able to get richer color with the color sticks than the colored pencils. They must be easier for little hands to regulate. Of course, I'm not suggesting we get rid of colored pencils. There are certainly times when colored pencils would be the better choice. For example, when trying to color in small, precise spaces. The box boasts "Create think lines & broad strokes" and that works to a certain extent- use the flat side for broad strokes and an edge for thin lines, but once the corners get worn down a little bit, the edges don't work easily, at least for me and my students. I tried using them color sticks on a mandala and found that I was having a hard time getting into small spaces. If I was having a hard time, then the students definitely would have. It would take some getting used to. 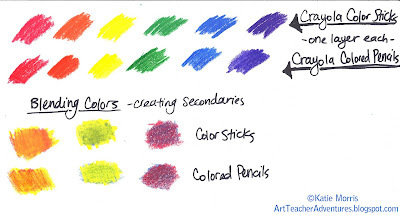 I'm actually planning to let the students use color sticks and colored pencils together on our next project. 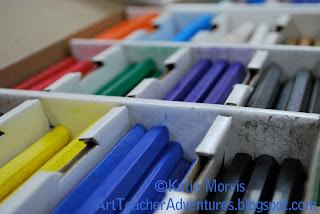 It will save them time sharpening when they only need colored pencils for small spaces and when they need different colors. So up next, a Pros and Cons list for Color Sticks. And now, the final comparison- PRICE! 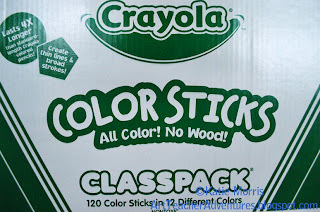 At first, the Color Sticks appear to be much more expensive, and they are. But I will argue that they save money in the long run. But don't give up on them yet! Since Color Sticks last 4 times longer, here is how the prices really come out. 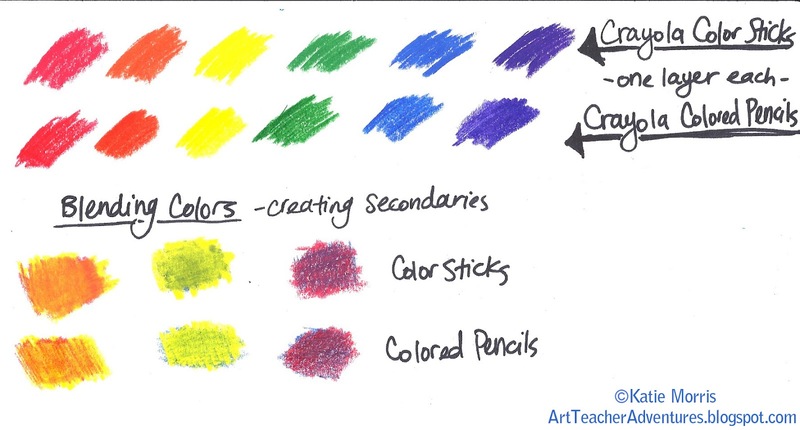 If you have room in your budget to invest in some Color Sticks, I recommend them! Thanks for taking the time to write and post this comparison. Our colored pencils dull really quickly which is frustrating. I didn't know the color sticks existed! Question: when you use colored pencils, do you sharpen them or do the kids? Do you ever pass out hand sharpeners? Would rather hunt for and sharpen all the dull pencils than work, or when someone isn't paying attention and dumps all the shavings on the carpeted floor! I have electric sharpeners in my class, so sharpening only takes a few seconds. With the lower grades, they have to ask me to sharpen the pencils. Once they realize that I say "no" to sharpening pencils that are only a little bit dull, they tend to spend most of the class working! Also, I'll quickly sharpen all of the pencils before they arrive. It's really quick with the electric sharpeners! I got a new one from X-acto this year, and it is wonderful. The older students get to sharpen their own pencils, and they have learned to be responsible enough to not waste pencils or time. I have an awesome electric sharpener that I use for regular pencils but apparently the wax in colored pencils burns up the motor over time so I don't use it for them. All the classrooms got sharpeners this year and it has really saved time! I love it when someone takes the time to review (and share) different media. Thank you!!! Katie, I still have pencils and hand sharpeners. But I can't find a good sharpener that lasts. What one do you use? My sharpeners tend to disappear so instead of buying nicer, metal ones, I buy cheap boxes of 12 so it's not too much of a loss if they disappear. Thanks for the review! I was not aware that Crayola had color sticks. So, what colors are not available in the sticks? My sharpeners disappear also. Inexpensive sharpeners is a must. Just getting them to throw the shavings away is the challenge. (and I have high school age!) I've been giving them a paper towel for their shavings, so they can throw them away. That seemed to work this year, except the ones who want to be mischievous. I've only seen the color sticks in sets, so I guess it's possible that they produce other colors and sell them separately. 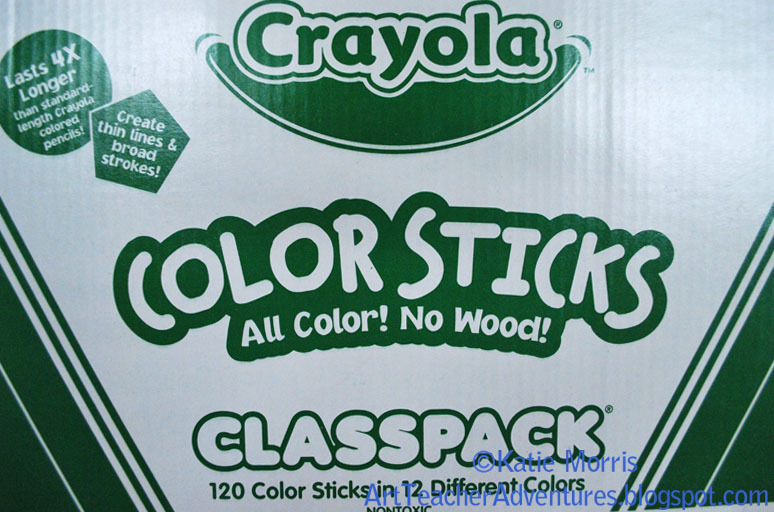 The class pack has red, orange, yellow, green, blue, violet, black, white, light blue, light green, tan, and brown. It is so cool that you took the time to do the quality, cost, effectivness comparison for all of your bloggie friends! I have been buying the 24 color packs at Michael's everytime I get a 40% off coupon from them. I haven't started using them with my students yet but I had wondered about the lack of a point ater usage. You answered that question for me, so thanks! I'm glad to know they're at Michael's because students keep asking me where I got them! I'm so glad to see this review! I just purchased some color sticks for my own art class and we are just beginning to use them. The pro of NOT SHARPENING EVER greatly outweighs the cons of not having a point. I was already calculating in more sharpeners every time I ordered colored pencils, so they were becoming costly anyway. Color sticks get 2 thumbs up from me! I LOVE color sticks on construction paper! It looks dreamy, like chalk pastels. You can't get the same results on colored paper with most colored pencils. Now I don't have to purchase Construction Paper Crayons or colored pencils made especially for colored pencils. That saves me storage room and money. I've even emailed Crayola asking for them to please make metallic color sticks! I sampled these at VAEA and can't wait to order them. Thanks for the tip about the class pack. I wouln't have guessed. very helpful thanks for the review!! I use a wide pencil hand sharpener (Faber-Castell Trio sharpener, but there are also cheaper ones available) on the color sticks and it makes a nice point for finer detail coloring, but the color stick can still be used on the sides, flats and corners on the other end.